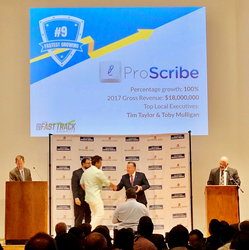 ProScribe, LLC, the nation’s largest independent provider of medical scribe services, was recognized by the San Antonio Business Journal as the 9th fastest growing private companies in San Antonio, TX. From 2015 -2017 ProScribe experienced nearly 100% growth and is on target to finish 2018 with $27million of revenue. Our success is based on creating true partnerships and providing the highest quality medical scribes, reliable coverage and responsive customer service. ProScribe employs approximately 1800 medical scribes across the nation. They are the recognized leader in providing the best-trained medical scribes and the most reliable shift coverage in the industry. For the past two years, ProScribe has covered 99.8% of all contracted shifts. In addition, ProScribe can deliver these outstanding services at cost-effective rates. ProScribe is one of the nation’s fastest growing providers of medical scribe services. Our innovative recruitment, training and quality assurance programs have successfully proven to increase physician productivity, patient satisfaction and improve physicians’ quality of life in a wide variety of practice settings.